I am happy to announce version 1.14 of the Asgaros Forum plugin for WordPress which comes with great new additions for your favorite forum-plugin. While other famous forum-plugins let you may much money for this feature, Asgaros Forum allows you to use polls for free! This optional feature which is enabled by default lets your users create short polls for new topics. You can decide if every logged-in user can create new polls or only moderators. Polls can get configured so the topic-creator can decide if users should be able to vote for multiple answers or only one. Note: After creating a poll it will be no longer possible to add or remove answers. This ensures the integrity of existing votes. However, it will be still possible to make text-changes to existing answers and to poll-settings. If major changes for a poll are required, you must delete the existing poll and create a new one for a topic. Since years Asgaros Forum were using the built-in WordPress Dashicons. 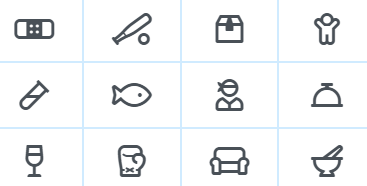 Those icons - which were designed for the WordPress backend - required a lot of styling-fixes and limited the possibility for users to choose specific icons for their forums. With this new version the popular Font Awesome icons are now used throughout Asgaros Forum. This allows you to choose between more than 1.500 free icons for your forums as well. It is possible to disable loading the built-in Font Awesome icon library in the settings to reduce traffic if your theme or another plugin already includes this library. Note: Because of this change of the used icon library, the forum-icons got all changed back to a default-icon. If you used custom Dashicons for your forums, its necessary to choose new Font Awesome icons for them. It is now possible to change the mode of SEO-friendly URLs. 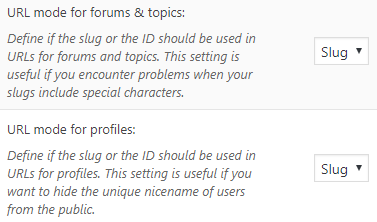 You can choose between slugs and ids separately for forums/topics and profiles. Adjusting the mode allows you to help you if you encounter problems with special characters or if you want to hide the unique nicenames of users from the public. Note: Be careful when changing the URL-mode! It is possible that existing links will not work anymore, and it may be necessary for search-engines to re-index your forum. Version 1.14 of Asgaros Forum will be available in the next 7 days via the WordPress Updater! WOAH!!! awesome update 😀 thx for this amazing plugin. Polls and font-awesome icon are greats idea. The update will be available later this week - before the weekend. About the icons... Can each icon be customized with a diferent color? With icon, you can modify the color with custom css.